FILE - Vice President Mike Pence waves as he walks on Capitol Hill in Washington, Jan. 3, 2018. U.S. Vice President Mike Pence embarks on a trip this week to Northeast Asia meant to enhance his profile — he plans to visit as many as 10 countries this year — and to help counter North Korea’s charm offensive at the Winter Olympics. Instead, Pence’s presence will be because of his “grave concerns” that North Korean leader Kim Jong Un “will hijack the messaging around the Olympics. The North Koreans have been master manipulators in the past. It’s a murderous state,” the official said. FILE - Japanese Prime Minister Shinzo Abe, right, and U.S. Vice President Mike Pence shake hands prior to a luncheon hosted by Abe at the prime minister's official residence in Tokyo, April 18, 2017. 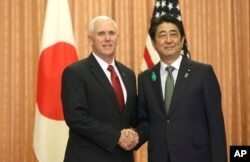 Administration officials say Pence’s discussions with Abe and Moon will be substantive. FILE - Olympians hold a flag at an event in Times Square to celebrate 100 days from the start of the Pyeongchang 2018 Olympic Games in South Korea, in New York, Nov. 1, 2017. Others attending as official members of the delegation are Pence’s wife, Karen Pence; Army General Vincent Brooks, commander of U.S. and United Nations forces on the peninsula; Brooks’ predecessor, retired Army General James Thurman; House Foreign Affairs Committee Chairman Ed Royce; Chargé d’Affaires ad interim at the U.S. Embassy in Seoul Marc Knapper; and 2002 Olympic figure skating gold medal winner Sara Hughes.